Your taste could vary from contemporary to farmhouse, designer to retro. One thing’s for sure, your kitchen space is small and you are a bit worried that the design of your dreams can’t be achieved. Take inspiration for the kitchen design ideas for your London home from magazines, social media, Google images or manufacturer brochures. Also draw on designs you have seen and liked such as a friend’s kitchen, your local kitchen design showroom or on TV. Implementing some of these small kitchen design ideas may prove a bit challenging, such as accommodating wine racks or mail storage. It is therefore important to focus on the primary function of a kitchen as a meal preparation area. Due to the small size of some London kitchens, it is also essential you create a bit of space during the design phase by using scaled-down or integrated appliances. Whether designing a small kitchen for a London townhouse or City high-rise, it is very important to visually expand the appearance of space in your kitchen. Coming up with the appropriate small kitchen ideas for your UK home is quite important and we’ve got some great tips. 1) Simplify the kitchen colour scheme: The colour you choose when designing your dream kitchen determines whether it will look smaller or bigger. White walls make a kitchen look bigger than normal so can prove a great choice in the design process; dark colours create a more intimate feel and therefore can make the room appear smaller. 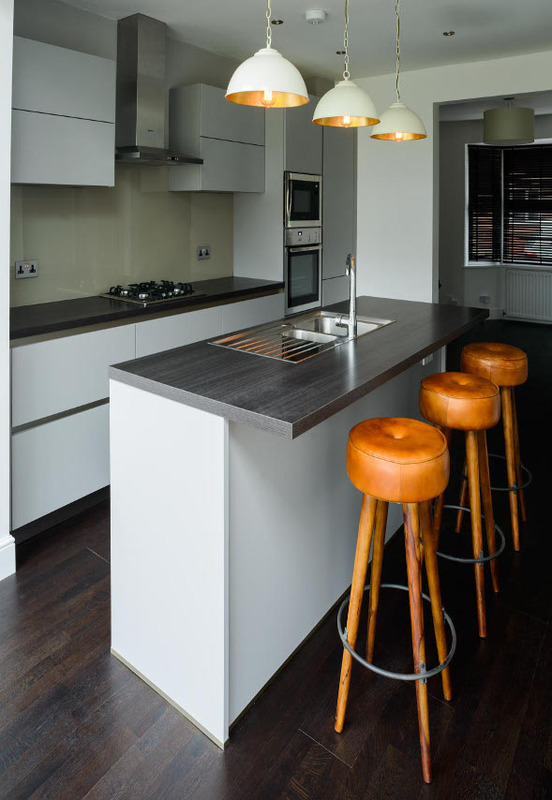 Taking it a step further, by utilising light and reflective materials such as mirrored glass splashbacks coupled with a minimalistic design you will ensure your London kitchen looks a bit bigger. A good choice in the design process would be a white composite stone worktop with white glass fronted cabinet doors such as these Schuller Kitchen designs. 2) A design that helps to reduce the clutter: A great design for a small kitchen in London (or any part of the world for that matter) should be one that reduces clutter. Wall cabinets are the first culprits as an effective kitchen design should get rid of these as they encroach on space. A design that accommodates open shelving helps in making a massive impact in a small kitchen. It is important you limit the number of open shelves used to ensure your kitchen looks and feels much bigger and spacious. 3) Smart planning: Planning is important in the designing of all sizes of kitchens but for a small kitchen, smart planning is crucial. A design that enables you to integrate appliances into your cabinets is important in helping your kitchen to look more compact and sleek. These are simple tips that you can factor in when designing your dream kitchen. As kitchens come in different sizes, we may not always be lucky to have a big one but can make the most of space with creative planning. A small kitchen if designed correctly should not look crammed but neat and compact. The little details are quite important when designing your small kitchen with an aim for making it look more spacious and classy. At KDCUK, we have a team of expert designers who are trained and equipped to help bring your kitchen design ideas to reality. Our experience and creativity can be instrumental in making your small kitchen look more spacious and elegant than anticipated. You can contact us on 01992 620 777 for a great design advice or to book a visit to our showrooms.